If planning events (albeit somewhat informally) has taught me anything, it is that the devil is in the details, but so is the delight! If you get too caught up in details of an event, you can overlook the fun – but the right details can enhance an event magnificently! This year, our prom theme was “Candyland“, inspired by the classic board-game, and I had more fun orchestrating the details than I should probably even admit. Decorating the venue is sometimes overlooked when planning events, but adding little details to the overarching venue decor can really pull a theme together. Thankfully there are an incredible number of fun sources of inspiration for these details. 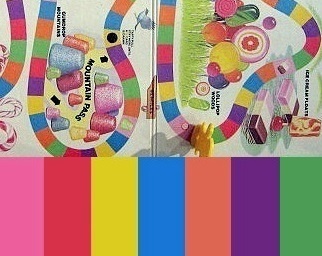 We chose to go with the 1978 edition of the Candy Land board for color inspiration and then proceeded to look for fun ways to incorporate those 7 (!) colors without becoming overwhelming! The first small detail we chose to incorporate was the lollipop balloons. While I’m fairly certain PVC pipe might have created a better lollipop-balloon stick, we used dowels, because they were very easy to procure. Once we had the balloons (in every color but the pink, which was our accent color), all that remained was to attach the balloons to the dowel tops (duct tape) and wrap the whole thing with cello-wrap before displaying these outside! While we originally wanted to do more (possibly line the walkway into the prom), we decided that it might lessen the elegance of the occasion, so kept it to a minimally sweet splash of color. Our second venue decor involved adding colors (and an extra dose of candy-theme) to the chair backs. Inspired by a blogpost, we purchased dollar-store paper plates (in our six main colors! ), a massive spool of ribbon and one serious roll of cello-wrap. Chaos ensued briefly while we wrapped and tied and juggled all 80 or so of these fake, over-sized sweets. However, once in place, the candy decor really lent a nice touch to the venue without detracting from the simply elegant setup. If doing this again, I would be more careful to purchase paper plates that were colorful on both sides to avoid the touch of white peeking up over the uninhabited chair-backs. Since it is rare to find a truly nice venue that permits wall or ceiling hangings, tabletops are always a huge element of the decor at our events, and this year was no exception. We started by seeking out the perfect central element to feature, and settled on colorful tulle puffs for the centerpieces. Since our goal was to incorporate the six general colors (red, orange, green, blue, yellow, and purple) with accents of pink and tie in many of the elements of decor, we chose to have pink and black table-runner-squares to offset the riot of color above and around. 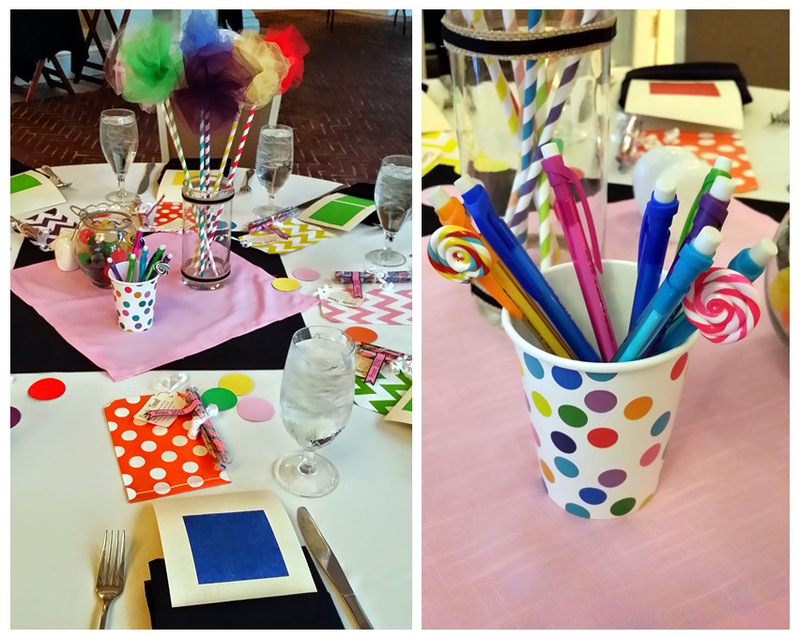 To this, we added mad-libs made to lo0k like over-sized Candy Land game cards, brightly patterned paper bags for students to use at the candy bar, a low jar of colorful gumdrops, and a few oversized-polka-dot shaped pieces of confetti. Fun fact: we used paint-samples from Home Depot to make the confetti, and were thus able to individually select exactly what colors we needed! A second, oft-overlooked detail is the need for some ice-breaker or fall-back activities. Just like when planning any social gathering, you want to try to foster a balance between creating a convivial atmosphere in which everyone can feel comfortable and fall-back options for people who may wind up feeling slightly uncomfortable. Let’s face it, nobody wants awkward silence to fall at a table, and when you take a big group of teenagers and add in assorted unknown individuals brought as dates, yards of extremely fancy (and often uncomfortable) clothing, and top it all off with unstructured time before dinner/dancing . . . well, the odds are that somebody will feel a little uncomfortable at some point. To try to get rid of this, we always include Mad Libs as an ice-breaker activity. You may have already seen my post about Candyland themed mad-libs, but these were a colorful addition to the evening, and with their glorious tendency to wind up inappropriate or hysterical, all we have to do is casually include them in the decor and many (dare I say: most) people wind up bonding through the ensuing laughter. In all honesty, after choosing the venue, we mostly wound up going with their catering options/suggestions. Thus, we can’t really take credit for planning any of it, aside from heartily agreeing to the delicious-sounding suggestions put forth by our fantastic liaison, Marie. The resulting feast was everything we wished for and more. Now, you may think Mad Libs, friends, and dancing are enough activities for any school dance. For some, you might be right. Buuuuuuuut, there are those moments when you are so hot and sweaty that you just need a dance break. Or those moments when the DJ plays a slow song and you want to avoid the awkward couples-dance with your platonic date while a nearby swaying duo is kissing like they’ve just discovered lips. OR maybe you just don’t like dancing all that much. I mean, school events shouldn’t be potentially fun just for the dancers among us, right? What a conundrum, you might be saying. Well, allow me to introduce you to the perfect solution. The Photo Booth. If you aren’t sure how to set up your own photo booth, I have a couple of sure-fire tips, but this is a great activity to include for those less-inclined to dance or who might need a break from crazy-dancing throughout the night! In addition to the fresh baked cookies and brownies, we almost always choose to include an ice cream sundae station. With all sorts of delicious treats (including Crushed Oreos, Reese’s Pieces, Rainbow Sprinkles, Shredded Coconut, Chocolate Sauce, Strawberry Sauce and Whipped Cream), students are free to momentarily cool their heels and build their ideal Sundae! So, as you can see, the details have carried us throughout the evening, and as the night winds down to a final dance, we want to make sure to include something students can take home to remember the occasion. Unfortunately, this usually means that you wind up with chintzy picture frames or a single engraved piece of stemware that will prove fodder for many yard-sales to come (if they last the ride home). With this in mind, we have recently taken to selecting favors that are consumable or thematically fun rather than the stereotypical trinkets. So it is with great anticipation that we included a simple Candy Bar in our evening plans. To let students know about the Candy Bar, particularly since it was slightly out-of-the-way, we made an informative tag, which we attached to brightly colored paper bags (found on Etsy) for students to use for candy transportation. We also purchased old-fashioned candy sticks, flavored like cotton candy, butterscotch, tropical punch and JOY. After adding a little homemade flag and placing the sweets on each place setting, the favors were ready. Based on their enthusiastic reception, I think it’s safe to say that they were appreciated. With the details in place and the evening past, I think it’s safe to call it a successful soiree. I can’t wait for the next! « Props to the Photobooth!